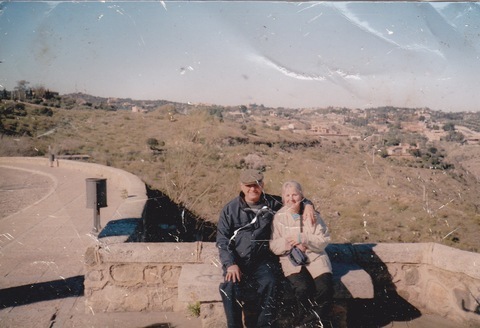 Anita Lebya found this photo of she and her husband Jim through the Lost Photos of Joplin National Disaster Photo Rescue after a 2011 tornado in Joplin, Mo. Photo courtesy of Anita Lebya. Not long after a tornado tore through Oklahoma on Monday, Facebook groups began to spring up with posts showing tarnished photos discovered in scattered debris miles away. Unclaimed memories, laid out before strangers in the hopes of catching a recognizing glimpse. It’s not the first time that lost and found sites on social media have been created after a natural disaster. Two years ago, on May 22, 2011, similar Facebook groups emerged when a tornado struck Joplin, Mo., sweeping photos away from owners. Two of those groups morphed into the Lost Photos of Joplin National Disaster Photo Rescue, run by the First National Baptist Church of Carthage, Mo. Thad Beeler, director of National Disaster Photo Rescue and minister of music at the First Baptist Church, said that at the time there was no formal process to redistribute the more than 35,000 photographs that had been collected. But shortly after, an organized system to clean and file photos was developed and, perhaps more importantly, a proper way to distribute those photos back to their owners was implemented. This isn’t just a simple photo pass-off; it’s a “reunification process” that connects a person to an old life. Each of the organization’s 50-plus volunteers is trained in grief counseling and are taught how to help a person cope with what is often an overwhelming moment. Anita Lebya is one of those people who was reunited with her photos, some of her only possessions to survive the Joplin tornado. After she and her husband “climbed out of a hole” from their crumbled home, they managed to find their car torn apart, a sewing machine, one dish and some scraps in the rubble. So, when she found not one but 10 photos through the Lost Photos of Joplin, “you would have thought I’d found a hundred.” She shares her story below. Anita Lebya shares her memories of reuniting with photos after a 2011 tornado in Joplin, Mo. destroyed most of her possessions. Since its creation, Photos of Joplin has returned 16,000 photos to their rightful owners. These type of forums serve as important keepers of people’s possessions. And when little of a persons’ pre-tragedy life survives, a picture is truly worth a thousand words of gratitude.